When this weekend began, I was not sure what I was going to end up writing about for my weekly blog. There are quite a few images and thoughts in my head. I participated in a “virtual” worldwide race. I was the only protestant at a workshop that my Catholic mother-in-law had invited me to, and ended up jotting down in my blog ideas notepad: Do I have tinnitus because I was a Rainbow Girl (the speaker had stated that sometimes the demonic aftereffects of being a Rainbow Girl manifested themselves in auditory ways)? The image that is begging to be written about is my son’s body language when he was not played at all in his Pop Warner football game after the first 10 plays of the first quarter. He played the first few series of the game (Pop Warner requires every player to be played a minimum number of plays (ten, I think)). I was late to the game after attending the workshop with Barb, so I missed the big debut. But after those series, nothing. He ran out a few times when “first defense” was called, but was sent back to the sidelines. I guess the coaches had decided to get his minimum plays out of the way first and have that done with. I heard him bring it up to the Team Mom, and she tried to make him feel better, saying “well you were in the first plays.” He brought it up to me, and I said the same unhelpful thing. Let’s just say I was relieved to have to leave the game a few minutes early to pick Tenley up from dance and leave the post-game processing to my husband. Wayne’s team won 20-0. There was not much doubt, by the fourth quarter, that his team was going to win. He would have loved to have been used for a play or two that last quarter. And for Wayne, part of the reason it matters is that the opponent team is full of kids from his middle school. He is proud his team has beaten them all three times the two have played, but he knows he is going to get some ribbing for his lack of playing time. Neither my husband nor I are insiders in this group. We have been the most unhelicopter-y of parents pertaining to playing time. We know he is not one of the most proficient players; we know he started out the season slow. We haven’t brought the topic up to the coaches. But, darn, it’s hard to see your kid dejected, to see all of that enthusiasm and team pride slipping away. I know that kids (and adults) learn from adversity. I remember how awful my first experience was at Junior Gardeners camp, how I could have vowed never to go back, but instead announcing when I got in the car, “I am going back next year and I am going to make it good.” I went to the same camp for years after that and had great experiences. I find it so hard as a parent to sit back and let that determination percolate in my children. When I talked to Wayne later in the day on Saturday, I went down that same “at least you played the first few series” road (when will I ever learn?). Over the weekend, I kept being tempted to send him emails letting him know I believed in him, to bring up the subject again, to invasively force some determination into his 11 year old psyche. I can’t do that. It’s up to him. I read a quote this week that resonated with me: To be is to fly the flag of one’s own shadow (by Godfrey Reggio). The older both of my kids get, the less control I have about who they will be or how they will embrace their strong parts and their weak parts. 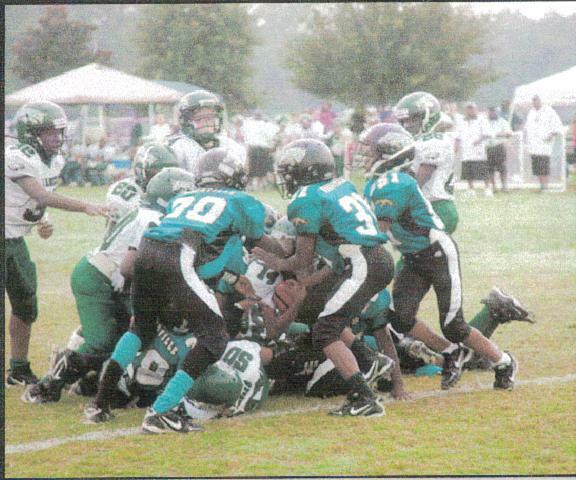 I just know that Wayne (#50) will always be on my first string! 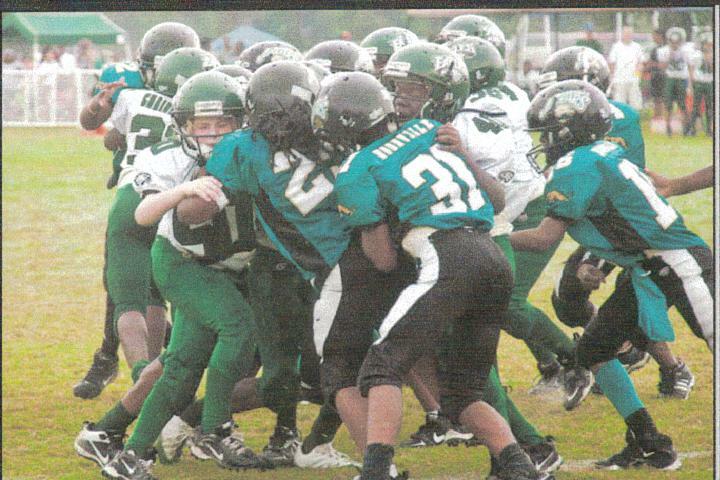 This entry was posted in Godfrey Reggio, Kids and Sports, Pop Warner Football by Paula Kiger. Bookmark the permalink. Yeah, it's heartbreaking. My son “played JV football last year at Leon. He spent the entire summer getting up at 6:30 am for practice in the 100 + temps. He gave up a family trip to Boston because he didn't want to miss practice. When the season started he did not play. Only the starters played. One game we were up something like 40-0 and he played for about 20 seconds. As a parent, I was angry and also felt bad for my kid and all the other kids that sat the bench all year. It's a hard lesson to learn but only the best will play and those kids need to learn that early. Gone are the days of “everyone plays, everyone get a medal”. He is in his 2nd year of JV and this year he was a starter. If he messes up a play, the coach pulls him and sets him on the bench to teach a lesson. Maybe these kids will learn that they have to work hard, they have to be conditioned and they have to be good to play. That is how is used to be when I grew up. We've taken this generation and turned them into kids and parents who think they are entitled to everything just for showing up. It's a hard lesson to learn, but life is not like that and we have learned the hard way. After the season is over, bring your son to our gym. We have gifted trainers who work with football players from middle school up to college. Nigel worked out with them and he improved in everything and put on 8 pounds of muscle. We hope our son plays pop warner football, but also realize maybe he will never want to. Its a hard thing as a parent to step back and let them make their own decisions. I'm having trouble with my husband pushing his 19 year old son to do something with his life….but in that case something has to be done at his age when they fail to do it themselves a good push into the real world is what he needs. But of course at the age of 11, its good to sit back and let them discover themselves…maybe he'll have a knack for another sport…. I sort of enjoyed, but mostly disliked sports as a kid. Overbearing parents were the worst and the situation you described happened to me and I saw it happen to other kids. It made me think that sports can do more harm than good. If I ever have kids, they can make their own decisions and if they decide not to play sports, I will not protest. Standing on the sidelines with the parents feels like it would be too much for me. Youth sports get taken too seriously.